This incredible Annex Log Cabin playhouse from the BillyOh range is a unique and exciting playhouse that will look fantastic in any garden and truly enhance your children’s play time outside! 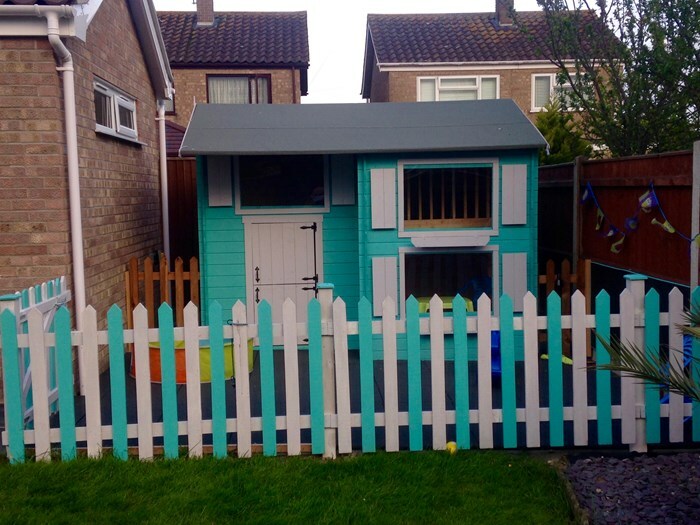 All of the the details of this playhouse have been carefully considered to provide the maximum amount of fun for your children. From the moment you enter the beautifully crafted stable door, the multi-room and two storey design will impress any adult, let alone little adventurers with a vivid imagination for play. Underpinning this unique Annex Playhouse is second to none craftsmanship and design, highlighted by the use of interlocking construction which maximises the structural integrity of the building. The stand out aspects of the Annex Log Cabin are the multi-room and two storey design features which offer a huge amount of space for children to play. 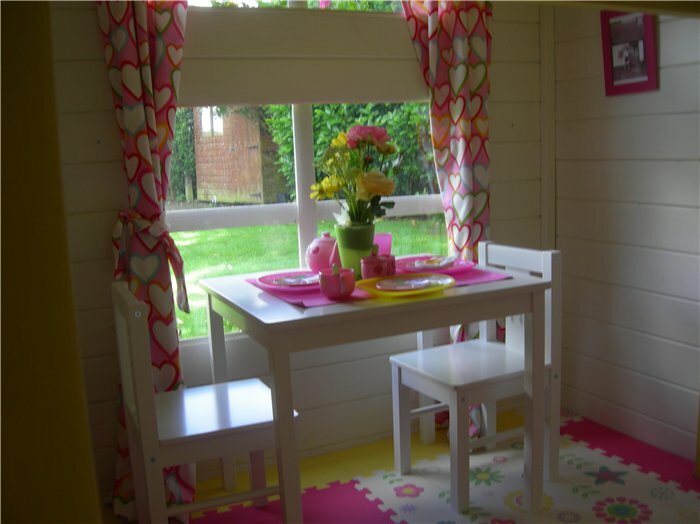 The multi-room design not only creates an exciting feature for children as they can wander around different spaces of their own unique playhouse. But, it also means children can create separate areas of the playhouse for their own uses. 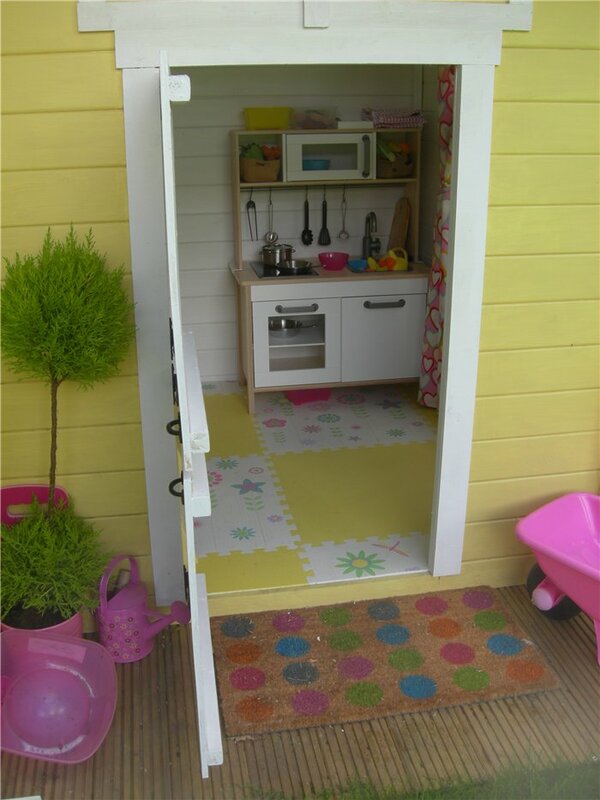 Why not create a mini kitchen where they can enjoy pretending to cook and prepare food. A playhouse with multi-rooms offers siblings their own spaces to keep their toys and play! 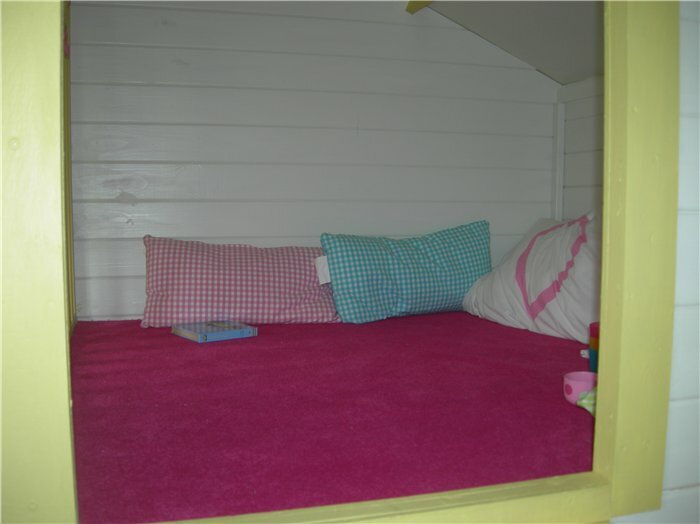 The raised bunk feature of the Annex Playhouse offers a snug and cosy hideaway for your children to read and relax in. 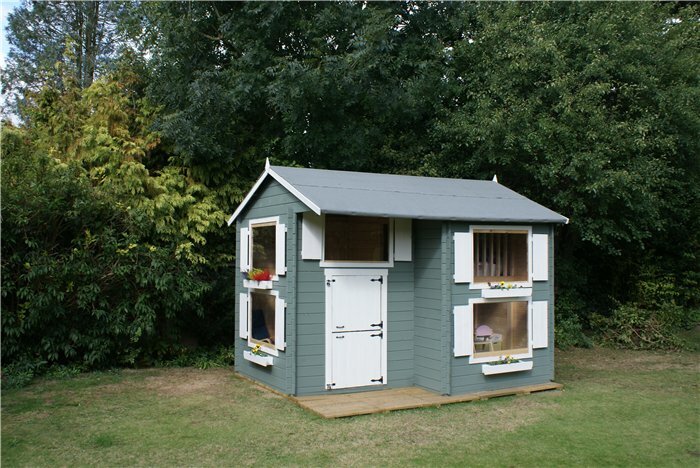 The extra bunk level makes an exciting addition to your children’s dream home in your own garden. It also provides them with valuable extra room for their friends when they’re having sleepovers. The raised bunk looks over the lower floor, giving a sense of an internal mezzanine which looks truly spectacular. The Annex Playhouse is constructed using our incredibly popular tongue and groove technique. 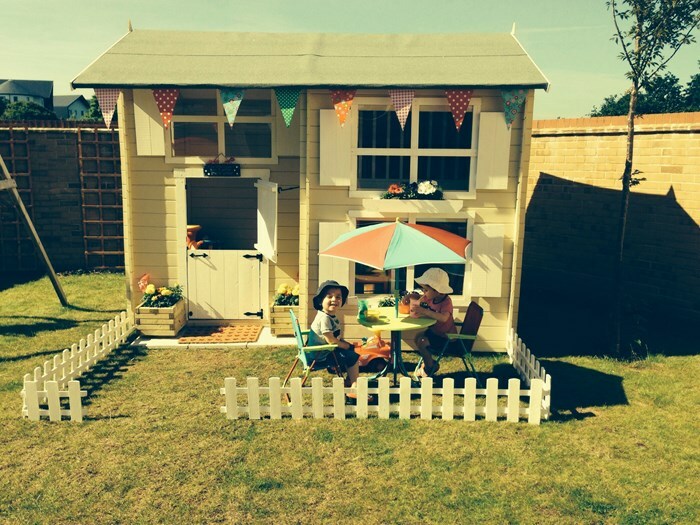 The 19mm T&G boards provide the playhouse with a strong and sturdy build. The panels are all pre-cut to length and the interlocking style of this construction means each board will hold the previous board securely in place. An additional benefit of this interlocking technique is that it allows the playhouse to be built in a number of styles suited to you. The 19mm T&G is bolstered further with rounded framing, ensuring that no sharp edges are present. The raised bunk is free-standing, using substantial joists all rounded for added safety. As well as providing a strong build, T&G also gives the playhouse great protection from the elements. As the panels interlock together, rain runs off the side of the building, ultimately preventing any long term rot issues. The Annex Log Cabin comes with a beautifully crafted stable door, adding to the cottage style appearance of the whole build. 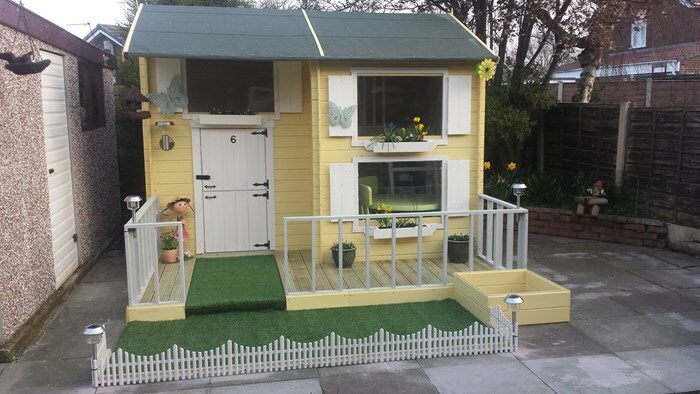 The cottage design will enhance the look of your garden as well as provide a fun play space for your children. The stable door gives children the option of having the top and bottom half either open or closed. Detailed features such as this, captures your children’s imagination and transports them to the cottages in their favourite fairytale stories! 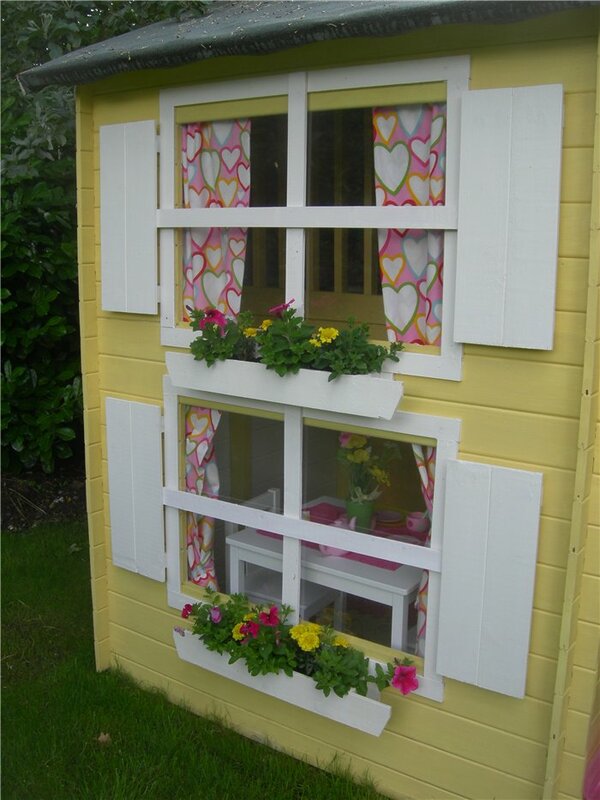 The five cottage style windows come with authentic shutters and flower boxes, enhancing the visual appeal of the exterior for this playhouse. You have the option of having traditional crosses in the windows or leaving the windows clear for a more contemporary feel. 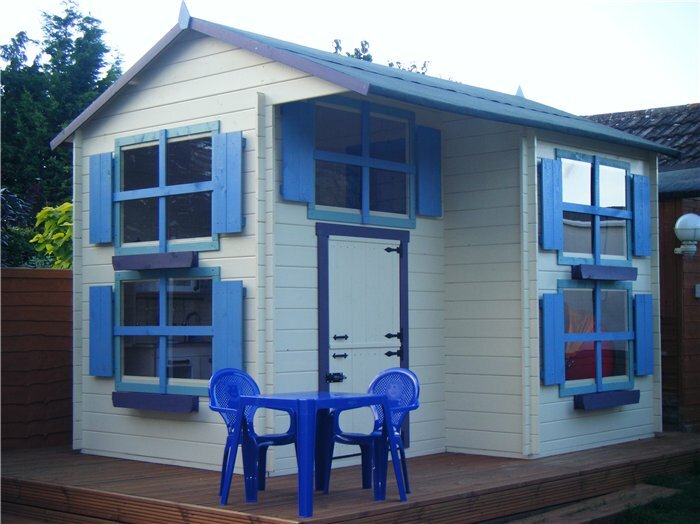 The playhouse comes with five sets of shutters and four window boxes which all add charm and character to the build. The flower boxes look great planted up with flowers and your children will have fun watering them! A solid sheet floor is included with the Annex Playhouse.This is pre-cut to size and is simply attached onto the floor joists, so all you need to do is lay it on the ground and build your way upwards. But if you plan to store larger and heavier items inside, you will need a stronger base for the playhouse. You can choose to upgrade it into a T&G floor which can provide a stronger foundation because of its durable interlocking construction. The T&G floor will not only provide a stable foundation to the playhouse, but also keeps water and other harsh elements from entering the shed. Also provided is a solid sheet roof. We supply the solid sheet for you, which is pre-cut to size and ready to assemble for a simple and easy installation. 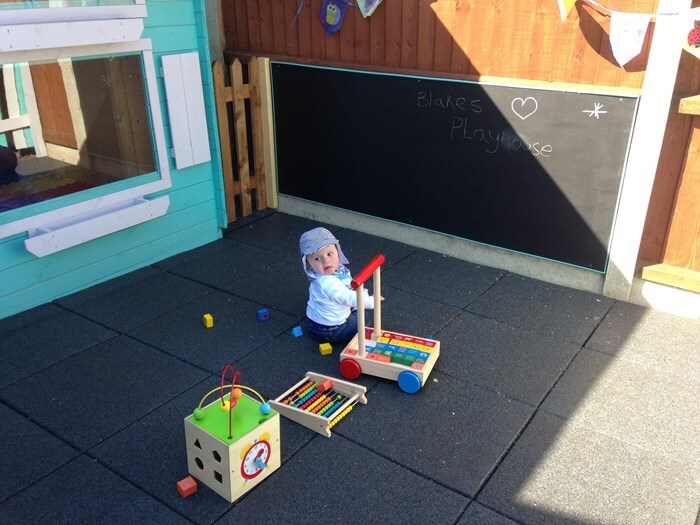 The green mineral felt which is supplied with the playhouse is a premium roofing felt which gives the building substantial protection from the elements. 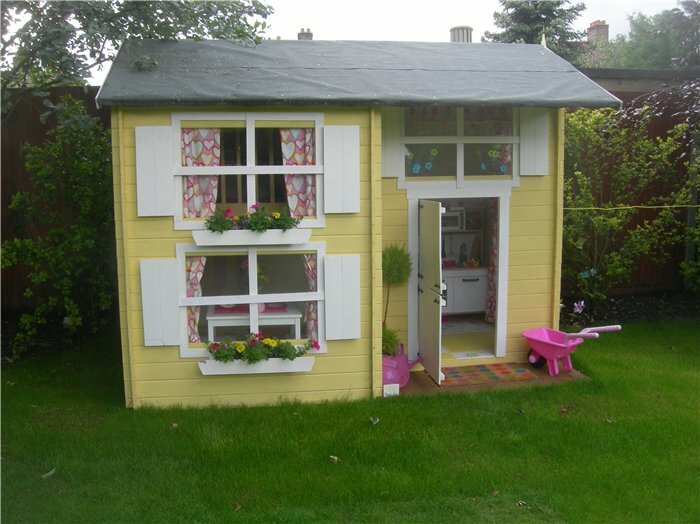 Be rest assured, this playhouse won’t suffer from dripping rain water! Eaves Height (Inc Floor) 193.1cm 6'4"
Ridge Height (Inc Floor) 239.9cm 7'10"
Eaves Height (Internal) 190.1cm 6'3"
Ridge Height (Internal) 232.5cm 7'8"
Window Dimensions 78.5cm x 54cm 2'7" x 1'9"
Door Opening Size (w x h) 60cm x 117.5cm 2' x 3'10"
Frame Thickness (w x d) 3.2cm x 2.7cm 1" x 1"